Learn more about Near Abroad by visiting the Oxford University Press website. G. Toal, C. Dahlman, Bosnia Remade: Ethnic Cleansing and Its Reversal. New York and Oxford: Oxford University Press, 2011. Winner of the 2012 Julian Minghi Outstanding Research Award, Political Geography Specialty Group, Association of American Geographers. Shortlisted for the 2012 Joseph Rothschild Prize in Nationalism and Ethnic Studies. Winner 2013 Silver Book Award, Association of Borderland Studies. Bosnia Remade is an authoritative account of ethnic cleansing and its partial undoing from the onset of the 1990s Bosnian wars up through the present. Gerard Toal and Carl Dahlman combine a bird’s-eye view of the entire war from onset to aftermath with a micro-level account of three towns that underwent ethnic cleansing and–later–the return of refugees. There have been two major attempts to remake the ethnic geography of Bosnia since 1991. In the first instance, ascendant ethno-nationalist forces tried to eradicate the mixed ethnic geographies of Bosnia’s towns, villages and communities. These forces devastated tens of thousands of homes and lives, but they failed to destroy Bosnia-Herzegovina as a polity. In the second attempt, which followed the war, the international community, in league with Bosnian officials, endeavored to reverse the demographic and other consequences of this ethnic cleansing. While progress has been uneven, this latter effort has transformed the ethnic demography of Bosnia and moved the nation beyond its recent segregationist past. By showing how ethnic cleansing was challenged, Bosnia Remade offers more than just a comprehensive narrative of Europe’s worst political crisis of the past two decades. It also offers lessons for addressing an enduring global problem. Learn more about Bosnia Remade or visit the Bosnia Remade website. 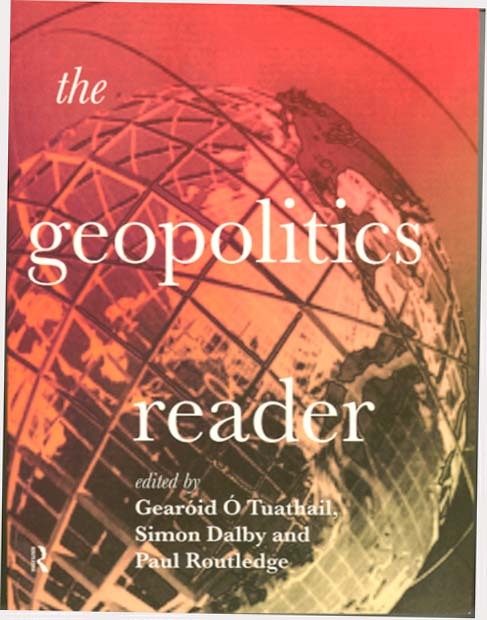 G. Ó Tuathail, S. Dalby and P. Routledge, A Geopolitics Reader. Second edition. Routledge, 2006. This extensively revised second edition of The Geopolitics Reader draws together the most influential and significant geopolitical readings from the last hundred years. A compendium of divergent viewpoints of global conflict and change, it includes readings from Halford Mackinder, Theodore Roosevelt, Adolf Hitler, George Kennan, Samuel Huntington, Edward Said, Osama Bin Laden and American neoconservatives. It draws on the most illuminating examples of imperial, Cold War and contemporary geopolitics, as well as new environmental themes, global dangers and multiple resistances to the practices of geopolitics. Whilst retaining a coherent five part structure, the selection of readings has been updated to account for recent developments in the critical study of geopolitics and the post 9/11 geopolitical landscape (including issues in technoscience, biowarfare, oil politics, and terrorism), and key questions address issues of the transformed nature of threats in the new millennium, the debate over the hegemonic position of the US, and non-American perspectives on contemporary geopolitics. Skillfully guiding the reader through the divergent viewpoints of global conflict and change, the editors, all leading geopolitical authorities, provide comprehensive introductions and critical commentaries at the start of each section. Illustrated with provocative cartoons, this second edition of The Geopolitics Reader is the ideal textbook for introductory classes on international relations, world politics, political geography and, of course, geopolitics, provoking lively discussion of how questions of discourse and power are at the centre of the critical study of geopolitics. Learn more about The Geopolitics Reader (Second Edition). 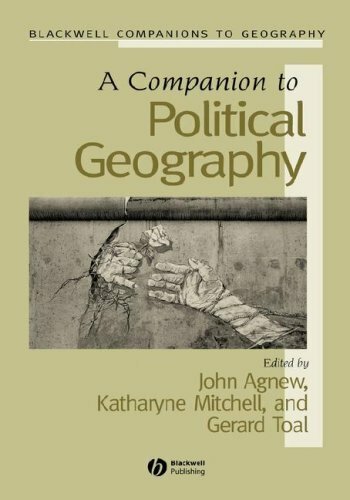 J. Agnew, K. Mitchell and G. Toal, eds., A Companion to Political Geography. Blackwell, 2004. A Companion to Political Geography presents students and researchers with a substantial survey of this active and vibrant field. – Introduces the best thinking in contemporary political geography. – Contributions written by scholars whose work has helped to shape the discipline. – Includes work at the cutting edge of the field. – Covers the latest theoretical developments. Learn more about A Companion to Political Geography. 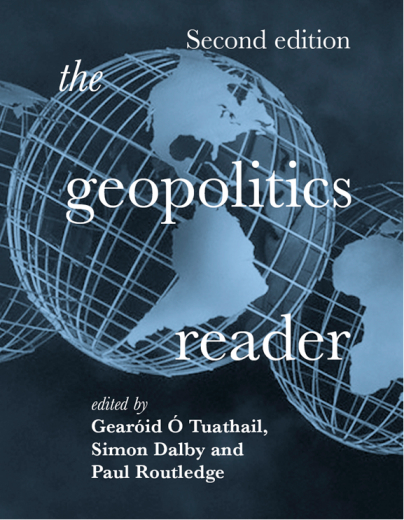 G. Ó Tuathail, S. Dalby and P. Routledge, A Geopolitics Reader. First edition. Routledge, 1998. The Geopolitics Reader offers an interdisciplinary sourcebook of the most important political, geographical, historical and sociological readings of geopolitics in the late twentieth century. The Reader is divided into five parts which draw on the most illuminating examples of imperial, Cold War, contemporary geopolitics, new environmental themes and multiple resistances to the practices of geopolitics. The editors provide comprehensive introductions and critical comment at the beginning of each part and visual ‘geopolitical texts’ in the form of political cartoons are integrated throughout. Encouraging exploration of divergent viewpoints of global conflict and change this invaluable compendium includes readings by Martin Luther King, Vaclav Havel and George Bush. Learn more about The Geopolitics Reader (First Edition). 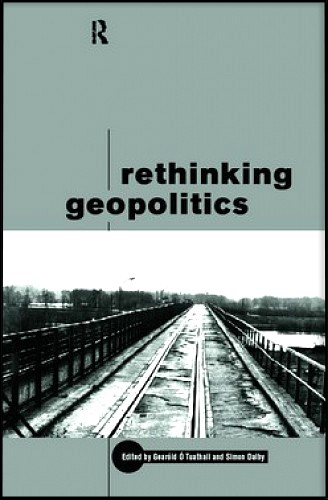 S. Dalby and G. Ó Tuathail, eds., Rethinking Geopolitics. Routledge, 1998. Learn more about the book Rethinking Geopolitics. A. Herod, G. Ó Tuathail and S. Roberts, eds. 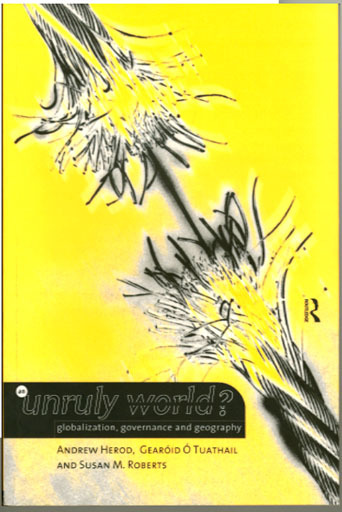 An Unruly World? Geography, Globalization and Governance. Routledge, 1998. An Unruly World explores the diverse conundrums thrown up by seemingly unruly globalization. Examining how fast transnational capitalism is re-making the rules of the game, in a wide variety of different places, domains, and sectors, the authors focus on a wide range of issues: from analysis of ‘soft capitalism’, and the post-Cold War organizational drives of international trade unions, to the clamour of states to reinvent welfare policy, and the efforts of citizen groups to challenge trade and financial regimes. An Unruly World argues that we are not living in a world bereft of rules and rulers; the rules governing the global economy today are more strictly enforced by international organizations and rhetoric than ever before. 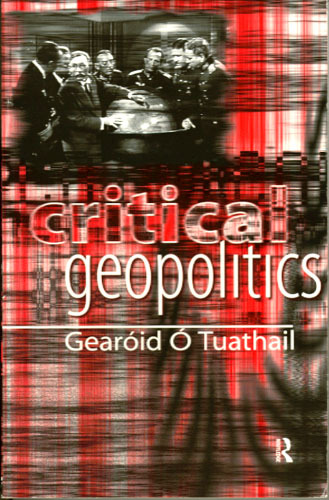 G. Ó Tuathail, Critical Geopolitics: The Politics of Writing Global Space. Minneapolis: University of Minnesota Press (Volume 6 in the Borderlines series) and London: Routledge, 1996. Critical Geopolitics presents an analysis of the ideas which have driven nations to attempt to remap the globe in their own image. The essays – ranging across Britsh colonialism to Nazi geopolitics, from America’s ambitions to the bloodshed of Bosnia and Ireland – aim to unearth a political history of the struggle for space and power in the West, and revise the geographies of global politics at the end of the 20th century. Learn more about the book Critical Geopolitics.